Quinn’s delivered a terse, very pointed 22 minute speech at the East Harlem Asthma Center of Excellence on Monday morning touting her record as City Council Speaker for the last seven years. The Speaker appeared very focused and firm, offering few smiles and even fewer of her signature laughs. After issuing a “good morning” to the packed room of press and supporters, including Councilwoman Inez Dickens, Quinn dove right into her speech. She never said her opponents by name, but Quinn defended every criticism from her opponents citing her record, not name calling. “This is not about what others have done. It is about this moment moving forward and I will stack my record against anyone who is running and quite frankly against anyone who has run,” Quinn said in a post-speech Q&A. Quinn has stayed away from taking pot shots at her opponents for much of the race, instead sticking to her proposed policies and vision for the future. Her opponents, including Public Advocate Bill de Blasio, and former City Comptroller Bill Thompson, have not done the same, hammering the speaker on issues such as paid sick leave, the controversial East 91st Street Marine Transfer Station, her vote in favor of extended term limits. Quinn delivered her speech right up the road from the site where the East 91st Street Marine Transfer Station, which will house the city’s garbage before being shipped to New Jersey, will be built. She reminded everyone why she fought so hard to have the waste station built in her own neighborhood. “It is a plan that, for the first time in history, said every borough has to take responsibility for its own garbage,” Quinn said. Opponents of the station have said the location, across the street from Asphalt Green, a 5-acre children’s athletic facility, is the issue. Multiple lawsuits have been filed to stop the facility, but the Army Corps of Engineers gave its green light last summer. Construction began in May and is expected to be complete by 2015. Quinn said the marine transfer station will continue under her because she believes outer boroughs should not suffer a higher burden of potential health consequences by having Manhattan’s trash shipped through their neighborhoods. Quinn touted she has made tough decisions in the past, and vowed to use that gumption in taking on the challenges the next mayor will face, including budget issues. The city’s union contracts are all expired, leaving a potential $7.8 billion tab for the next mayor to pick up. Quinn gave the most detail about the impending situation to date, having said in the past she would not negotiate contracts in the press. In response to Speaker Christine Quinn’s morning speech, former City Council Member and Democratic Mayoral candidate Sal Albanese said, “While Speaker Quinn is right that our opponents are particularly unaccomplished, her record is nothing to write home about. “We’ve seen Christine Quinn’s New York: term limits overturned, hospitals and schools closed, and legislation watered down. As the city grew more unaffordable for regular New Yorkers, she rolled out the red carpet for plutocrats. Now, they are repaying her loyalty. From real estate developers alone, she’s accepted more than $1.5 million. 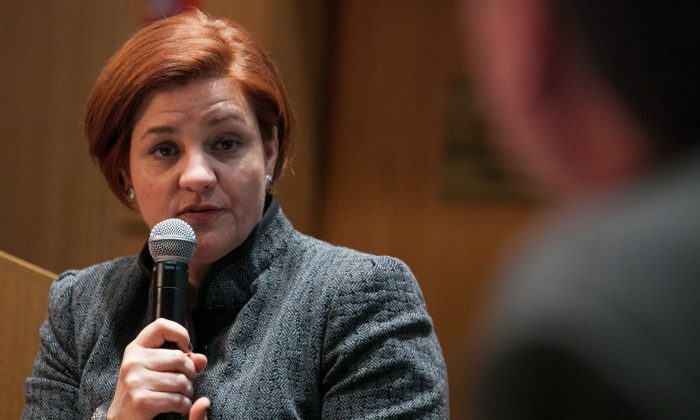 City Council Speaker Christine Quinn presented a series of proposals aimed at continuing the public safety record enjoyed by the Bloomberg administration.